CEO Alison Grieve was interviewed by Gillian Marles on BBC Radio Scotland's Business Scotland programme this weekend. Hear the full programme here or read the full transcript below. Gillian Marles, voice over: Scotland has a great history of invention. If it wasn’t for us, there wouldn’t be TV, colour photography, grass-collecting lawnmowers, marmalade, cotton reel threads, fountain pens… The list goes on. However, we didn’t invent the wheel, but a Scot did invent the pneumatic tire that goes around it. And we’re still an inventive nation, but not so good at making money from those inventions. Alison Grieve is one woman hoping to change that. She is Chief Executive and inventor of the Safetray. Alison Grieve: I used to have an events business, and in my former years I was a waitress, so I knew the trials and tribulations of carrying trays. At one event, there was a particularly spectacular accident involving a trayload of champagne glasses toppling over just before the host of the event was about to walk in. There were champagne glasses everywhere, glass on the floor, the cost of the champagne alone was a couple of hundred pounds, and it was very embarrassing, costly and, of course, dangerous. So those three reasons helped me to invent the Safetray. GM: But did you have it in your head that you were an inventor then? AG: The truth is, that for quite a number of years, in fact ever since I was a child, I used to say “when I grow up I want to be an inventor”. My parents even have a tape of me saying I wanted to be an inventor when I grew up, so there was definitely a desire there. As part of my events business I used to be a consultant at a business events organisation, and saw fantastic financial services, lawyers and accountants. But I used to think that it’s quite sad that a nation that gave birth to incredibly famous engineers, world-renowned scientists and inventors who shaped the world was so focused on services, and that manufacturing had kind of been left by the wayside. I loved the thought of physically manufacturing a product that came out of a machine in Scotland and could travel the world. So there was a bigger motivation there. GM: But having an idea, and having it in your head that you wanted to do something … there is an awfully long way before you actually get to be an inventor, and to producing something in Scotland that you then sell. AG: There are some inventors who are quite methodical about how they invent, so they will look at a problem, they will look at, perhaps, existing patents, and they will look at developing an idea further – that’s one kind of inventor. But the other kind of inventor, or perhaps invention, is one that you simply can’t plan. You can’t plan a eureka moment, and the time when I thought about trays, and about the ridiculous way that they’re made, I leapt out of my chair when I came up with that idea. It was literally a moment of a flash, a bubble that just popped on my head, so that I didn’t really plan. However, after that, because I had this motivation to physically manufacture a product, I knew, as soon as I saw my sketch on a bit of paper, I thought, “that is the one, that is the one”. Within a couple of weeks I’d stopped doing all events. I knew it would take all of my time and energy to devote myself to this product. GM: Unfortunately this is radio, but describe to us what makes this different to a [normal] tray? AG: Although you can’t see this, the Safetray has a clip on the underside. Now you don’t notice it because it just stacks up normally like a regular bar tray, but when you pull it off a bar or a surface, it comes down and it presses against the back of your knuckles. It means that when there is a heavy weight, even an entire bottle of wine right on the edge of the tray, you use your knuckles to control the tray, to keep it horizontal, so you can confidently do single-handed service without fear of the tray becoming unbalanced and toppling over. GM: It is amazing. So you had this idea, you had your sketch, what happened then? AG: Well, I looked into how, when you have an idea, can you go about outsourcing things like someone to do the CAD drawings, and somebody to source the manufacturing company? I learned about how you can protect your idea with things like Non-Disclosure Agreements, and that’s what I set about doing. I found a product design consultancy, Fearsomengine in Glasgow, and rather than pay them for their services, I gave them equity in the company, because I wasn’t a cash-rich entrepreneur. I had a business that really paid for my life, but not a great deal else. GM: Did there come a point where you would say to people that you’re an inventor? When did that happen, or has it happened? Is that what you say you are? AG: It’s difficult when someone asks what you do, because the invention happens in a flash and then everything else is selling the product, pulling together a good team, raising money, all the other roll-your-sleeves-up hard bits. It starts to feel a bit false, saying you’re an inventor, because it seems like it’s such a long time ago. But recently, now that we’re starting to develop new products, there’s another few patents that will be coming out, and again I feel like an inventor. GM: Just tell me about the scale of the company you’ve got now, before you go into the new products and expanding in whatever way. What is the scale? AG: There are four operational staff and there’s a board of five. We export across five continents now, and our major markets have been America, the Middle East and Australia. It’s been a very full-on year of travelling, which sounds very glamorous but it’s quite exhausting actually! But it’s necessary and it’s very exciting to think of these Safetrays, which were just a sketch on a scrap of paper three years ago, going to countries that I’ve never even been to before, swirling around these incredible venues, from salsa venues to pizza restaurants, to high-end bars serving celebrities in LA. It’s just a very exciting thing to be part of. GM: What pieces of advice could you give to people who are early in the journey of inventing something? AG: My advice would be that it’s not an easy ride, and that you can’t be disheartened by that. You fill find that there are always more people who oppose you than support you when it’s a game-changing item, and so rather than take that personally, just understand that and embrace it, and understand why people react against innovation. Try to understand the psychology behind that, instead of being hurt by it. Looking back, the most painful experiences have actually been the most enhancing to me as a person. It might not feel like it at the time, but no pain, no gain. GM,VO: Alison Grieve. We met at the BBC canteen; her office is off-limits because they’re testing new, top-secret products. Posted on November 26, 2012 by Helen Milburn and tagged alison-grieve safetray profile. Safetray has been named as a finalist in this year's prestigious International Trade Awards, in the SME category. The ceremony, which last year was held in the Houses of Parliament, takes place on the 10th December and our CEO Alison Grieve will be flying down to London to represent the company. Look out for news closer to the date, but in the meantime we'd love to hear from other companies who will be attending - hit us up on Facebook and say hello. Posted on November 1, 2012 by Helen Milburn and tagged safetray awards news. Safetray was included in the Financial Times' supplement 'A Blueprint for British Business'. CEO Alison Grieve spoke to Paul Solman about the benefits of exporting. Since Safetrays are sold all over the world, she had a lot of interesting points to make. ...Safetray Products is a business that sees its future primarily in overseas markets. Alison Grieve set up the Edinburgh-based company just three years ago to sell her invention, a tray that has a retractable handle to stop it toppling over. Already she has landed distribution deals in the Middle East, Australia and North America. She, too, says government support was important. "We were lucky in that, although we aren't really part of the food and drink sector, we can slip into that category," she says. "So in the Middle East there was a food and drink trade mission and a lot of UKTI support, and we were able to jump on that bandwagon. We also used Smart Exporter, a Scottish [trade support] scheme." Nevertheless, Ms Grieve says UK companies that want to sell their own inventions abroad often struggle to protect their intellectual property - an issue that government schemes fail to address. "For all but the largest companies it would be extremely expensive to defend your patent in different markets," she says. "What many companies do is end up licensing their innovations away at a very early stage. "That is where the government is missing a trick, because what you get for a licensing deal in the early stages is not what you get if you hold on, start manufacturing and start to sell - which is what we have done." Posted on October 25, 2012 by Helen Milburn and tagged safetray news. Posted on September 27, 2012 by Helen Milburn and tagged safetray news. Make sure you also visit our new Buy page, where you will find details of our global distributors. Posted on September 20, 2012 by Helen Milburn. 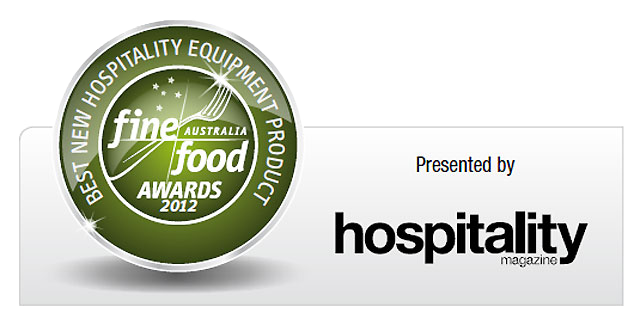 Australia has been a brilliant ride so far, and we're delighted that Safetray has been selected as a finalist in the Hospitality Equipment category of the Best New Product Awards 2012 at Fine Foods Australia. Posted on September 12, 2012 by Helen Milburn and tagged awards news safetray. Leading Australian hospitality news portal Hospitality magazine has featured Safetray in advance of Fine Food Australia in Melbourne, where we will be exhibiting on stand A1 from 10-13 September. Invented by a former waitress and events manager, the Safetray is a service tray for busy wait staff featuring a discreet retractable clip on the underside. After witnessing a spectacular accident involving a tray full of champagne glasses, Alison Grieve came up with the idea for Safetray, where servers slip their fingers into the clip, increasing the tray's stability and preventing spills and slips. Research by Iris Worldwide found that 91.8 percent of servers had been involved in or seen an accident involving a tray at work. Of the respondents, 72.4 percent gelt that managers underestimated the difficulty of mastering a tray and 35.1 percent estimated the cost to the venue of a tray spill that they'd been involved in to be over £30. Safetray is manufactured in the UK from polypropylene and high grade, wipe-clean rubber and has a five year guarantee against delamination. They can be washed in commercial dishwashers and lie flat when not in use, so the trays can be stacked when not in use. Posted on August 30, 2012 by Helen Milburn and tagged safetray news. Posted on August 29, 2012 by Helen Milburn. "An excellent example of innovation within the hospitality industry." Alex Cotterill, Director, the Park Hyatt Sydney, speaking about Safetray. It's a trip that's been two years in the making, but in just two short weeks the Safetray crew will be touching down in Australia to see our trays in action Down Under. Safetray will be exhibiting at the Fine Food Australia show in Melbourne, 10-13 September, so come along to the Melbourne Convention and Exhibition Centre, where we'll be showing off on Stand A1 (naturally). We'll then kick off another epic episode of Safetray on Tour, with three weeks travelling up and down the country, visiting our customers and distributors and getting more Australians on board the Safetray train. Look out for updates here, lots of Whole World on my Tray images, and adventures galore. If you're in Australia, drop us a line and we'll come and say hello. It'll be bonza, mate. Posted on August 28, 2012 by Helen Milburn. Safetray was showcased on leading UK industry website BigHospitality. Read the full story by clicking the link below. A new style of tray which promises to make it easier and safer for waiting staff to carry and deliver drinks and food to tables has been launched in the UK. Posted on August 22, 2012 by Helen Milburn and tagged news safetray. Safetray was featured in the August/September issue of Business Comment magazine, with CEO Alison Grieve talking about Business Gateway. "A recent example of an Edinburgh business that has benefited from Business Gateway support is that of Safetray Ltd (www.safetrayproducts.com), a young company producing a non-topple drinks tray that has secured deals to supply to two of America's largest food service companies and a renowned hotel with its innovative product.Sodexo USA, Compass Group USA and Four Seasons Hotel, Las Vegas were among the first to purchase the Safetray, a non-topple drinks tray invented by Alison Grieve, who came up witth the idea for the product after a tray of champagne worth hundreds of pounds toppled over at an event she had organised. Speaking about the major order, she said: "Securing orders with such leading names in the hospitality industry highlights how innovative the product is. The orders have also sparked interest in the product from across the globe. It's amazing to think that a product made by a small Scottish company will be used in places such as Alaska, San Francisco and New York." 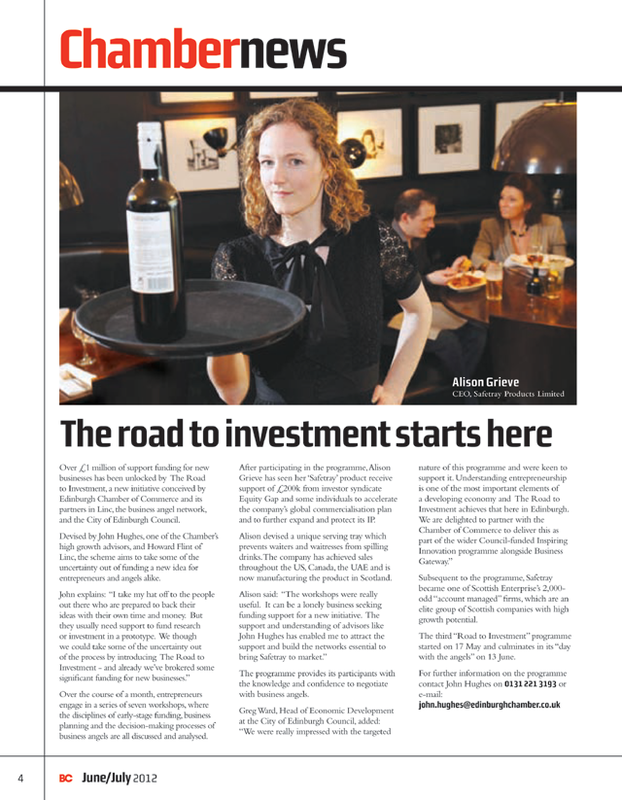 John Hughes, Business Adviser, Business Gateway Edinburgh, said: "When Alison first came to us we immediately knew that her product had the potential to take the hospitality market by storm. We've supported the business through one-to-one advice, via our workshop programme and introduced Alison to other specialist agencies, all of which has helped turn her idea into a marketable product in a short period of time." Speaking about the support offered, Alison said: "Business Gateway has supported me every step of the way - from ensuring my business plan was robust to helping me with the latest investment round. My adviser put me in touch with Scottish Enterprise, whose market research highlighted that the US was going to be the product's biggest market, with 60% of their top 100 bars providing VIP table service areas. This focused my attention on cracking North America first." She added: "We are a classic Business Gateway story, in that we needed to develop intellectual property and it helped us secure a grant to do that; we needed to expand and so it put us in touch with the SDI; and now, with only one in 20 companies successful in an investment round, its support has helped us to secure finance. In terms of economic development, Business Gateway has done its job. We are now about to take on two new members of staff, with a further two later in 2012, and we're grateful for the help." Posted on August 1, 2012 by Helen Milburn and tagged alison-grieve safetray. Safetray has been chosen as a showcase product in respected American trade publication Foodservice Equipment Reports. The undersides of Safetrays feature a retractable clip that servers can slip between their fingers for instant stability. The trays provide far greater balance and security than regular trays and make it easier to load up without fear of spilling or tipping food and drinks. The base of the tray is injection molded with a mixture of polypropylene and glass fiber to create the perfect mix of grip and durability. A rubber overmold on the surface is a soft grade of food-safe rubber, which features a 5-yr guarantee against delamination. Safetrays can stand industrial glass washers and come out looking like new. The product has just received NSF certification." Posted on July 17, 2012 by Helen Milburn. Safetray is mentioned in a feature in the Guardian about the Marketing 4 StartUp Britain award, which we won last year. Our CEO Alison Grieve will be speaking at this year's event, which takes place on Monday 16th July. Other speakers include Facebook's European customer marketing chief Felicity McCarthy and Mumsnet co-founder Justine Roberts. Safetray fought off stiff competition from other start-up brands such as Rocktails to take home the top prize, a year's marketing agency services from Iris Worldwide. Read the Guardian's coverage below. Digital and advertising startups are being given the chance to win the services of an established agency for a year to help get its business off the ground, in an initiative backed by the government. Lord Young, the minister for employment relations, is to open a free event next week called Marketing 4 Startup Britain which aims to drive the entrepreneurial culture in the nation's creative and technology industries." Posted on July 9, 2012 by Helen Milburn and tagged safetray news. CEO Alison Grieve spoke at the Business in the Parliament conference last month, and was praised by First Minister Alex Salmond in his opening speech. Click below to watch the full video. The section where the First Minister mentions Alison begins at 46:20. "The next generation of people to emulate is here amongst us today, and with us in the communities of Scotland. The people ... here range from Alison Grieve, whose Safetray business was established two years ago but is now exporting to Europe, North America and the Emirates, to Jim McColl who famously started as an apprentice at Weir Pumps and is now Chief Executive of Clyde Blowers, a company that employs thousands of people across the planet." Posted on July 6, 2012 by Helen Milburn and tagged alison-grieve safetray news. Event magazine covered the Marketing4StartUp Britain award, and mentioned Safetray as the inaugural winner. "Last year, Safetray – a device to prevent dropped catering trays featured in Event's What's Hot – was picked out of the 88 entries to win the services of Iris for a year." Posted on July 2, 2012 by Helen Milburn. ...After participating in the program, Alison Grieve has seen her Safetray product receive support of £200k from investor syndicate Equity Gap and some individuals to accelerate the company's global commercialisation plan and to further expand and protect its IP. Alison devised a unique serving tray, which prevents waiters and waitresses from spilling drinks. The company has achieved sales throughout the US, Canada, the UAE and is now manufacturing the product in Scotland. Alison said: "The workshops were really useful. It can be a lonely business seeking funding for a new initiative. The support and understanding of advisors like John Hughes has enabled me to attract the support and build the networks essential to bring Safetray to market..."
Posted on June 14, 2012 by Helen Milburn and tagged safetray news. But such examples of success also work to highlight the bigger problem: if we have success in these areas, why not others? Since successful businesses can be built from next to nothing, why are there so few?" Posted on June 11, 2012 by Helen Milburn. CEO Alison will be appearing on Sunday Politics this weekend, 12noon on BBC1. Here's a sneak peek of her filming at McLaren Plastics, where the Safetrays are made. Posted on June 8, 2012 by Helen Milburn and tagged alison-grieve news safetray. One of the USA's leading online magazines for the hospitality industry has featured Safetray in a great piece about its benefits to servers and restaurants. Rmgtmagazine.com picked up on a survey we did about the hidden costs of tray accidents and included lots of interesting information. We were also headline news in their biweekly newsletter, FSInsider. Read more here and make sure you sign up for their informative newsletter here. Posted on May 30, 2012 by Helen Milburn. Haymarket Publications' Event magazine has chosen Safetray as its "What's Hot" selection for this week - see the full article here. "What's the point of creating exquisite canapés if they're going to be scattered on the floor when a serving tray tips over? Safetray is a new product being used by companies like Compass Group and Sodexo to avoid dropped trays by keeping food and drink perfectly balanced when they are served. The clue is in the name - Safetray is an adapted tray that remains steady thanks to a retractable clip on its underside, which slips between the server’s middle fingers to offer stability using downward and horizontal traction. Even if your waiting staff are perfectly poised, they could benefit from the handy clip: a survey conducted by Safetray found nearly a quarter of hospitality staff have suffered an injury because of a toppled tray." Posted on May 11, 2012 by Helen Milburn.